Creating columns and charts for whiteboards, planners, and walls. Use 5S Tape™ Multipurpose Tape on almost any surface. Thanks to its durable material, this tape can tolerate tough conditions. 5S vinyl floor tape is a great tool to use in your 5S or Lean work environment. If you're searching for a tape product with just a little more durability, then we recommend you check out our Smart Stripe Tape. Smart Stripe Tape differs from 5S Tape™ Multipurpose Tape because it is thicker and able to withstand the demands of heavier traffic levels. 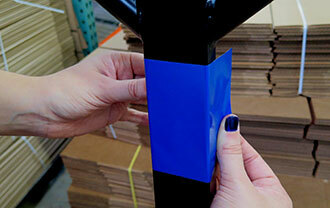 In addition, our industrial SafetyTac® tape is also a helpful solution that is extra durable. At Creative Safety Supply, we carry a wide assortment of marking solutions to meet even the most unique and challenging needs. We offer free samples of our tapes so you can be the judge of what tape will best fit your unique needs. Give us a call at 866-777-1360 or fill out our online form and start testing out our high-quality, industrial-grade tapes today! Check out our full list of tapes by clicking here. 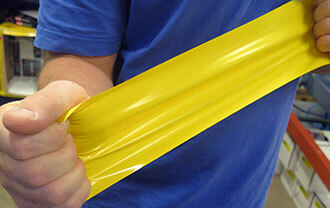 We can offer wider vinyl tape from 1" to 48" wide. We have all colors and sizes in stock. Call to find out how to order sizes that are wider than the drop down menu found on this page and to get pricing. Creative Safety Supply also offers a number of solutions including colored vinyl floor marking tape that can be used in warehouse and office spaces. At Creative Safety Supply, we guarantee the quality of our products. If youÌ´Ì_'re unsatisfied with your purchase, you can return new, unopened items within 30 days of purchase for a full refund. That way you can feel confident the products you order will meet your expectations, or you'll get your money back. These tapes are great quality and affordable for what I need. Great product. Just the right size and sticky enough to last through water testing. Just wanted to get back and thank you for the fast shipping and let you know the product is working great. We use this in all of our 5s projects. These guys have all the sizes and colors. Great Job. Also, Adam is a great sales guy. We have a community room/gym in our church, and I used this to tape lines on the floor for basketball games. I ordered this tape thinking it would be a while before I got my tape but I received the tape quickly. I just ordered a couple more rolls for marking in my new Kaizen station and for my tools. We used a 3m tape in the past but this is a lot more cost effective. I didn't want to paint our work floors and our carpeted areas (obviously), so we use this tape to outline various things we need to mark out for our 5S program. Price is good, and the rolls last a long time for us.